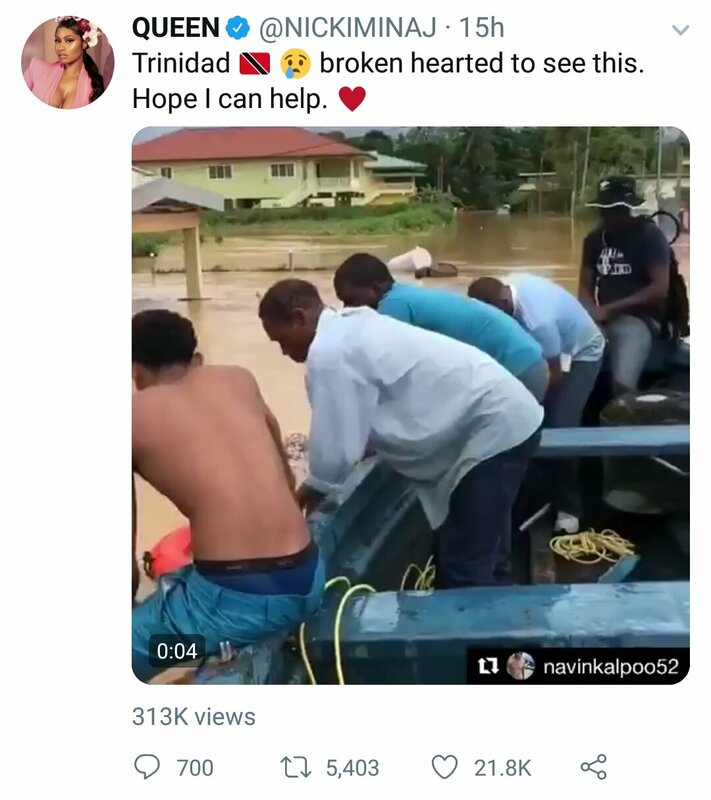 TRINIDAD-BORN hip-hop queen Nicki Minaj, US rapper Busta Rhymes, Tobago-born break out actor Winston Duke and ragga soca artist Bunji Garlin were among the celebrities expressing solidarity with this country after devastating flooding over the weekend. Minaj (real name Onika Maraj) in a tweet on Sunday said "Trinidad (flag symbol) (sad face) broken-hearted to see this. Hope I can help." Rhymes (real name Trevor George Smith Jr) posted in Instagram "prayers up for all our people of Trinidad." Duke, who appeared in the blockbuster superhero film Black Panther, tweeted "My thoughts are with my home country, Trinidad and Tobago, as they cope with the effects of heavy rains and nationwide flooding. My heart is with you! I have been stunned by the devastation but also comforted by the amazing efforts of everyday folks towards each other. This is T&T." Garlin (real name Ian Alvarez) in a tweet said people abroad had been asking him and his wife Fay Ann Lyons-Alvarez how they can send aid to TT and he pointed them to him Habitat for HumanityTT and NGO Is There Not a Cause. Reply to "Minaj, Busta, Bunji express solidarity after floods"